A sick or dying tree can be not only an eyesore but also a safety risk for yourself and your family if it were to fall. A dying tree left undiagnosed can also endanger other trees and plants in your yard. In this post, we will talk about a number of things to look for if you feel your tree is sick or dying. Decay isn’t always easy to detect considering it’s the inside of the tree that begins to decay first. Visible exterior symptoms can include fungi-like spores, dead branches, and wood that is soft and easily breakable. Cracks in general are not always a bad thing as some are natural, so it’s not always easy to tell when there is an issue. Cracks that are deep can have an adverse effect on the structure of your tree. Tree cankers are infected areas of trees that come from bacteria or fungi getting into the tree through an open gash. Like a human canker sore, the stress caused by the bacteria or fungi being inside the tree manifests itself in dead bark sores on the outside of the tree. This is pretty self explanatory – deadwood is pieces of tree that are dried out and dead. If you notice that your tree is growing in a problematic way such as leaning in one direction or growing in an unnatural way. Typically these issues are caused by high winds or improper pruning. 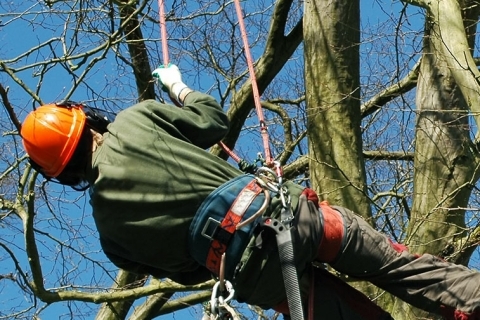 If you have a tree that you feel is in trouble, do not hesitate to contact Seaben Tree Service in Kalamazoo today. At Seaben, we pride ourselves on being the most trusted and experienced providers of tree services in Portage and Kalamazoo.